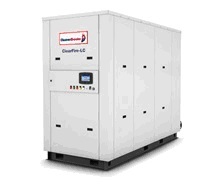 February 06, 2013 - "Capabilities "
Cleaver-Brooks is proud to introduce the ClearFire®-LC (CFLC) high-capacity, condensing hydronic boiler. Using a high-turndown burner with advanced controls and patented AluFer® heat-transfer technology, the CFLC offers 98% efficiency with ultra-low emissions. The product combines the core heat transfer technology of AluFer tubes with the spiral tubes used in Cleaver-Brooks EX technology, which lead to the creation of a large condensing boiler with high efficiency and increased capacity with a small footprint. The system is much more cost-effective than installing non-condensing boilers or multiple smaller boilers and can save companies up to 50% in operating costs compared to a hot water or traditional steam system. The CFLC is available in six sizes from 4,000 to 12,000 MBTU/hr and each system comes complete with the boiler, burner and controls for multiple lag/lead configuration. Visit their website for more information about Cleaver-Brooks and the ClearFire-LC.